Do you love a good Calzone? Me too! 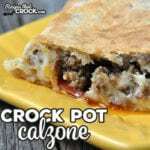 And now you can easily make one at home with this Crock Pot Calzone recipe! Quick, easy, delicious! Unroll your refrigerated pizza crust on a slightly greased surface and spread it out using your hands or a rolling pin. Sprinkle your toppings and cheese on one half of the crust. Fold the crust over the top of your toppings and pinch all the edges shut. Gently place your calzone in a lightly greased 6-quart crock pot. Cover and cook on high for 2 hours, flipping the calzone using 2 large spatulas when there is 30 minutes left of the cooking time. If desired, place your cooked calzone on a baking sheet and place in your oven on broil (hi if you have the option of Hi/Lo) for 90-120 seconds to brown up the outside. Cut into 4 pieces and serve. You can use whatever your favorite pizza toppings are. We used sausage and pepperoni. You can use whatever you want! Love mushrooms? Throw ’em on! What about peppers and onions? Throw them on too! Make this one your own! You can put as little or as much of each topping as you want! You don’t have to do the broiling step, but I love using my broiler to crisp up food that has been cooked in my crock pot. Make sure you watch it closely. A broiler can take a recipe from perfection to burnt in the blink of an eye! As with any of our recipes, carb counts, calorie counts and nutritional information varies greatly depending on which products you choose to use when cooking this dish. All slow cookers cook differently, so cooking times are always a basic guideline and should always be tested first in your own slow cooker and time adjusted as needed.